HÃ¤agen-DazsÂ®, as you know, produces a diverse array of premium brand frozen treats. You may also know that they pride themselves on producing some of the best ice cream on the market. Beyond simply eating ice cream as it is, HÃ¤agen-Dazs has been encouraging customers and chefs to use their products as ingredients â€“ decadent ones for sure. This effort has generally been referred to as â€œMade Like No Otherâ€Â® events â€“ amplifying one of their tag lines. Adventurous chefs and innovative restaurants have produced tasting events where gourmet meals have included HÃ¤agen-Dazs products in at-times surprising pairings. For example, Nicole Strada (of the â€œThats not how momma does itâ€ blog) describes a HÃ¤agen-Dazs “Made Like No Other” tasting event at the California restaurant Flora. She describes the meal as including â€œgrilled prawns & confit of pork belly, with Happy Boy Farm summer squash, romesco, Persian plums, pecans, and basilâ€ where the pork had been glazed with the HÃ¤agen-Dazs Cabernet Blackberry sorbet. Ice cream is quite perfect on its own but it can actually be fun experimenting with it as an ingredient. Today I share a recipe I created in the spirit of HÃ¤agen-Dazs “Made Like No Other”. I built on the delicious taste combination of caramel + salt by creating a salad with the HÃ¤agen-Dazs Dulce De Leche ice cream. I was not sure I could pull off something delicious but managed to make something quite tasty and very unexpected. 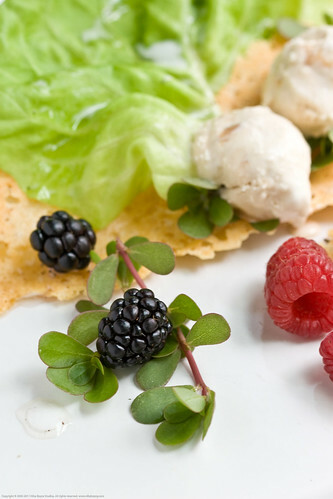 Its part salad, part decadence, something entirely new and hard to classify. My whole family enjoyed this salad. 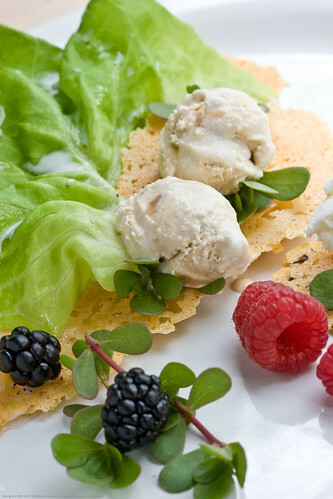 You can change things a bit and simply serve it as bites for hors d’ oeuvres â€“ making thicker frico (cheese chips) and layering a bit of lettuce, ice cream, fruit, and sauce â€“ all eaten as a single bite. However you do it, just try it! If you do, let me know what you think. Using a melon baller, form small balls of the HÃ¤agen-Dazs Dulce De Leche ice cream, place in the freezer until time of serving. Using two small spoons, form quenelles from the chevre cheese. Sprinkle with a light touch of dried fennel, touch of salt. Set aside either in the fridge or the freezer. Preheat oven to 400F. Line a baking sheet with parchment paper. If desired, use spray on oil and put a very light coating of oil on the paper. Mix the grated cheese, pinch of salt, flour and cayenne. Place a tablespoon of this mixture onto the parchment paper and press the mix into a thin layer. Bake for 8-10 minutes until the cheese has melted and is slightly bubbly. Do not brown the cheese. Remove from the oven and allow to cool. You can carefully and gently shape the cheese over forms or with your fingers before it cools. To some of the remaining grated cheese, add the lavender buds, repeat as above. Rinse the berries and pat dry. Rinse the lettuce leaves and the golden purslane, pat dry, keep cool. Allow the 1/4 cup HÃ¤agen-Dazs Zesty Lemon Sorbet to melt, add freshly cracked pepper â€“ to taste, keep cool until serving. 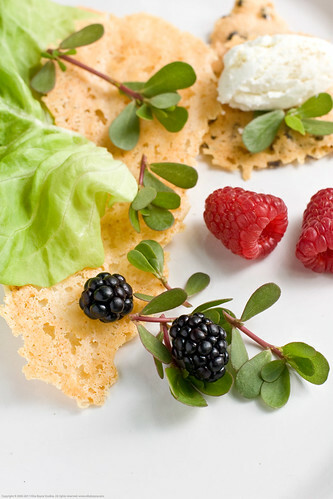 Place frico on plate, layers with lettuce and purslane. Add berries. Add a couple balls of HÃ¤agen-Dazs Dulce De Leche ice cream on top of the frico. Add the chevre quenelles. Drizzle with the HÃ¤agen-Dazs Zesty Lemon Sorbet pepper sauce. Lightly sprinkle the HÃ¤agen-Dazs Dulce De Leche ice cream balls with fleur de sel just before serving. Visit the BlogHer HÃ¤agen-Dazs Round-up page! All HÃ¤agen-Dazs products mentioned are protected under Â©HDIP, Inc.